Plums are a soft round, smooth-skinned with sweet flesh inside and a centrally placed hard stone. Their growing characteristic is based upon the country of origin and they are grown all over the world that varies in their color, size etc. Plums are a good source of dietary fiber that is known to help regulate the functioning of the digestive system. Fiber adds bulk to your stool and can help to prevent constipation. Fresh plums are an excellent source of vitamin A and C, which are powerful natural antioxidants that help the body to develop resistance against infectious agents, counter inflammation and scavenge harmful radicals. Plums contain various health promoting poly phenolic antioxidants such as lutein, cryptoxanthin and zeaxanthin in significant amounts that play a role in aging process and cancer. They are good source of minerals like iron and potassium. Iron is required for red blood cell formation. Potassium is an important component in the body that helps in controlling heart rate and blood pressure. Plums are rich in B-complex group of vitamins that serves as a co factor in body's metabolism and vitamins K, is important for blood clotting mechanism and help to prevent Alzheimer's disease. Like any fruit, you can simply cut the plum or eat the entire fruit, ripe. Dried plums in general known as prunes are added to cereals, cakes, ice-creams, etc. 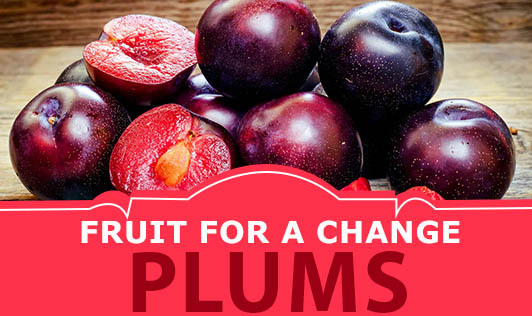 Choose plums as a variation to your regular fruits to obtain the benefits and they are the perfect fruit to eat when you are busy, or on the run! !